Blown over from Australia and America, these temporary tattoos from IAMU Collective are hot & happening. Temporary tattoos are the perfect accessory for every occasion, whether it’s a party or festival, or even a wedding to spice up your outfit. You can make it as big and outrageous as you like, it’s only temporary anyway right. The tattoos from IAMU are easy in use, just like the old ‘gum wraps’. You cut out the part of the tattoo you want to use and remove the see-through layer from the white layer and place the white layer on your skin. Use a wet sponge to wet the white layer for approx. 10 seconds until you are able to remove the white layer easily from your skin. The Henna and Egyptian inspired collection from IAMU Collective are both spread on an A4 sized sheet and have between 47 and 53 temporary tattoos on them for you to use. They both consist out of different types of tattoos which enables you to creatively express yourself anyway you like. A nice sleave, gold foil feathers on your back or a nice henna tattoo piece on your chest. Anything is possible. 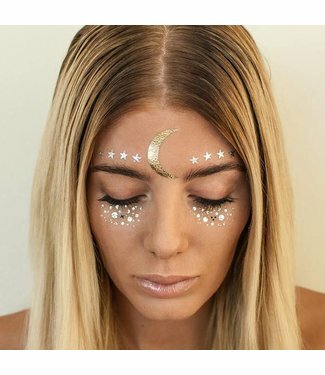 The temporary facial tattoos are perfect for star- and moonchilds, packed on an A5 sized sheet and are perfect to accentuate your eyes. Of course all three collections from IAMU can also be combined, mix and match however you think is beautiful. There are endless creative possibilities for you to completely steal the show. The temporary tattoos will last 3-6 days on average, but they can obviously also be removed before. This is also something that goes easy, you can use any type of oil to remove it; like massage-, baby-, or coconut oil for example. Order them today before 17hr and get them delivered within 4 workingdays!